Integrating logistics, all the way from the source plant through the DC onto the store shelf, reduces errors, exceptions and transit times. Many have discussed the advantages of integrating management of inventory and replenishment across the retail supply chain, from the factory through the manufacturer's DC, the retailer's DC, all the way to the store shelf and POS (Point of Sale). But what about integrating logistics from the factory to the store shelf? That represents an opportunity for innovative and agile efficiency that I call ‘extending the DC.’ The concept of extending the DC evolved from an enlightening conversation I had on this topic with Diego Pantoja-Navajas, CEO and founder of LogFire, at the recent CSCMP conference in Philadelphia. LogFire is a software development and supply chain execution company specializing in SaaS WMS. When their customers started asking if they could also manage inbound and outbound transportation and even putaway in the store, LogFire responded. When talking about extending the DC, it is instructive to look at automotive manufacturing plants where the best ones have very tight (15-minute) delivery windows for inbound trucks carrying the parts that feed the production lines. They are treating their inbound trucks almost as if they were conveyor belts feeding the lines in the factory. Retailers have been doing something similar, constantly trying to shorten delivery windows and transit times (receipt-to-ship time) through the warehouse/DC. This is especially true in cross-dock and flow-through operations, such as in grocery, where freshness is a concern. Even in other sectors, such as apparel or hard goods, additional speed and precision are being strived for. LogFire's WMS, which is easily configured to meet user needs, is one of the most advanced in the industry. 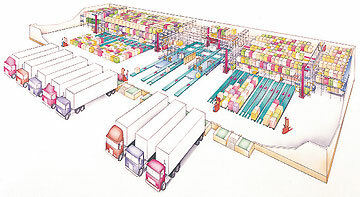 Though the flow of products to and through the DC begins at the factory, LogFire's system starts even further back in the process by managing the sourcing processes: sending RFQs to potential suppliers, evaluating responses, selecting suppliers, and then issuing POs specifying precise quantities and delivery times. 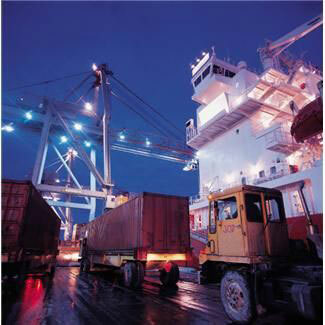 The order thus becomes the basis for managing shipments from suppliers’ factories. LogFire’s system has portals for the supplier (shipper), carriers, consolidators, and deconsolidators. The information for the order is already in the system and each of the participants simply adds their piece of new information about the disposition of the shipment against the order. This creates more visibility, control, and automation of the end-to-end process. For example, once a container is on the water you can plan your deconsolidation. An ASN is automatically sent, triggering a dock appointment request at the DC. There is now a flow of information between all the participants in the inbound process from factory door to DC door. This reduces errors and creates opportunities for streamlining operations and improving efficiencies. With this increased inbound visibility, you have high confidence that the product will arrive in the allotted receiving window, enabling the cross dock or flow-though DC to run more smoothly with fewer exceptions and delays. Outbound is only as good as the receiving process. For a flow-through facility, if you have good, timely information about what is being received, then things flow smoothly and you can reduce average transit times. By extending the reach of the system to include delivery confirmation at the store, you can close the loop all the way from factory/source to delivery at store. LogFire's system also supports home delivery with confirmation. And if returns are needed from the store, such as damaged or excess merchandise, the entire process is simpler and more reliable because you are using the same system being used to run the DC. The information is already in place. LogFire can manage receiving at the store, performing all the checks and balances. Once received and in the back store, the system can trigger putaway to the sales floor, using the same basic technology used for putaway in the DC. Locations can be as specific as desired, down to individual shelf-location-level on the sales floor and in the back store. It is straightforward also to pick from back store locations and send to a customer loading location, for example when ordering a TV or other large items. Using the same system for ordering, inbound, DC, outbound and store, provides traceability of products within one system. This helps tremendously in many areas that are traditionally challenging, such as reverse logistics—the system simply creates an ASN for items being returned into the warehouse. The number of integration points required between systems is dramatically reduced, as are maintenance, support, and training efforts. While we have written much about the advantages of SaaS with regard to speed of implementation, flexibility, and aligning solution provider incentives with end user goals, the LogFire story adds another angle to the ‘SaaS Advantage.’ LogFire started out as a WMS vendor. As a SaaS vendor, it was easy to incrementally extend their solution bit-by-bit to fulfill customer requirements as those needs became apparent. Instead of having to build or acquire a separate TMS module, LogFire has selectively implemented the inbound, outbound, and now store logistics functions, that were the highest priority for their customers. These become simply an extension of their existing system, rather than whole new modules. 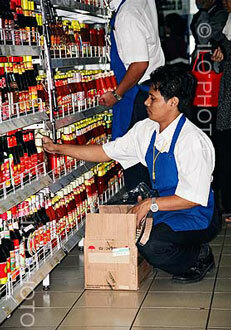 Through this, they have successfully extended the reach of the warehouse/DC to go end-to-end from factory to shelf. That has provided their customers with important new value via more granular, timely, accurate visibility, enabling more streamlined and optimized logistics processes.